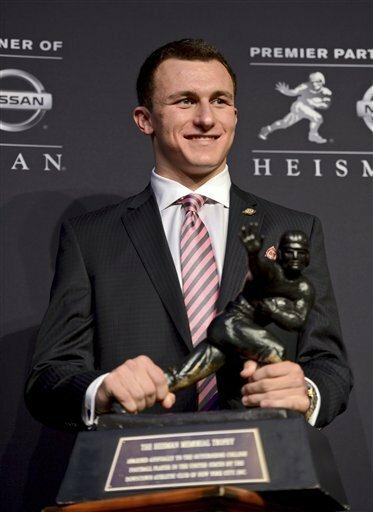 History was made on Saturday at the Heisman trophy ceremony as a freshman was named the 2012 Heisman Trophy winner: Johnny "Football" Manziel of the Texas A & M fightin' Aggies. He was truly a deserving winner for some breathtaking plays he made in both passing and running in leading the Aggies in their first year in the SEC to a 10-2 record and a #9 national ranking. Just watch this one play against the #1, at the time, Alabama Crimson Tide. While I am not a Texas Aggie, I get chills every time I hear the Texas Aggie War Hymn played by the Fightin' Aggie band. Texas A & M has great tradition as they are home "of the 12th man. Now they have made history as they are the only school whose Heisman trophy winner was a freshman. The Aggies will play the Oklahoma Sooners in the 2013 Cotton Bowl. I will be rooting for Johnny Manziel and the Texas Aggies. "Gig 'em Aggies! This is your moment! Enjoy it.